Are you looking for this software called “007 facebook hack v1.0″ also known as “James bond’s facebook hack” that can hack your friends facebook password in minutes? If yes then you are at the right place. First let me ask you something, Are you damn sure that you can cheat facebook’s login using this software? 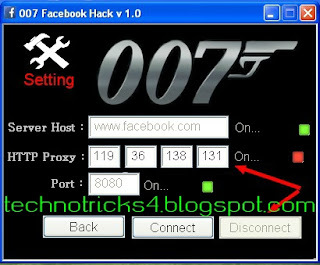 are you so confident that this stupid software called 007 facebook hack v1.0 will hack any facebook password within Minutes? ..if you feel so then how about hacking Lady Gaga’s Facebook account? ..You cant..believe it. see the video below, after watching it, am sure many of you will be tempted to try it. -Who Created such fake Software’s ? Let me make it clear that there is No software available that can hack facebook passwords exclusively. So who created such fake softwares? ofcourse hackers. By installing such Fake softwares you are exposing yourself to potentially high risks. These softwares are actually spyware, that once installed on your system, will rapidly upload any sensitive data of yours like credit card details or saved passwords to the creators server. -Is it Possible to hack my friend’s facebook account? Ofcourse it is. Let us discuss some known ways to hack facebook passwords. Below are some common ways a hacker uses to hack into anyone facebook account. If you have physical access to your victim’s PC then hardware keylogger is the best choice for you. And if your victim is at remote location for eg: if you want to hack your friends account then software keylogger is the best option for you. Phishing is the oldest way of hacking. Phishing is an example of social engineering techniques used to fool users. The common method used is “creating fake login page“. Phishing is typically carried out by e-mail and it often directs users to enter details at a fake website whose look and feel are almost identical to the legitimate one. The disadvantage of this method is the face that everyone is aware of this and Smart people will always check the URL of the Page Before entering login details.